But there’s nothing matter-of-fact about Neri’s debut, Chess Rumble, a 2008 ALA Notable Book, or his second Middle Grade novel, Yummy: The Last Days of a Southside Shorty, due out this spring. These two, very different tales, have common denominators, they feature male protagonists and take place in the inner city. As librarians and parents, alike, implore publishers to produce more “boy” books, G. Neri has created two that just may bring more males into the readers’ circle. BBS: The term “boy” book. Love it or hate it? Greg Neri: I use it but I don’t like to refer to young adults as boys. I don’t mind it if it’s for a middle grade book. BBS: Chess Rumble is a free-verse novel, Yummy, a graphic novel. Do you believe using those styles makes your books more appealing to male readers? Greg Neri: I’m trying to re-think the notion of what a book means to urban teens. Many teens can make it through high school without ever having read a book of fiction. But that’s because to them, books are big, full of words, and told in a voice that is alien to them. Most of these kids are now born into a more visual society, so I think playing with graphic novels and illustrations and using voices and characters that you don’t see often in literature is a big plus for reluctant readers in the city. I see my books as gateway books to Jane Austen. BBS: Have you found that being of mixed ethnicity has been a plus, negative or non-issue as a children’s author when it comes to marketing your books or yourself? Greg Neri: I think it’s good because people can’t quite tell what I am. I’ve passed for black, Latino, Italian, Arab, Israeli and so on. I think that makes it okay to talk about more cultures. I am a multicultural writer, literally. BBS: What types of books have yet to be written targeting young multi-cultural readers? Greg Neri: I think the possibilities are endless. The more bold, the better. I’d like to see more multicultural books move away from the noble, perfect example of a (insert ethnicity) person’s life and into more colorful, robust works. BBS: Booklist says Chess Rumble “will have particular appeal among reluctant readers and young, inner-city teens.” Was your audience a conscious thought as you penned the novel? Greg Neri: Absolutely. I found my niche and that’s urban teen fiction for boys. That being said, I’ve been surprised how universally it’s been accepted. Even white middle-class girls that have nothing in common with Marcus’ life, totally get it. BBS: How has your experience as a film maker and digital media producer made being an author easier? More challenging? Greg Neri: Easier because I went through the Hollywood game as a filmmaker. The book business is set up in the same way, but much less ruthless. Hollywood is full of sharks because that’s where the money is. It’s a joy compared to that world. Almost everyone I’ve met in books is incredibly supportive and positive. BBS: Looking beyond the obvious reader (inner city, African Americans, young males, reluctant readers), tell us what makes Chess Rumble a good read for any reader ages 9-13? Greg Neri: I’d like to think it’s a good story, period. It has fantastic illustrations by Jesse Joshua Watson, a unique voice and really, there’s nothing else quite like it out there. We’ve had a great response from students, teachers, and librarians, and very good reviews all around. 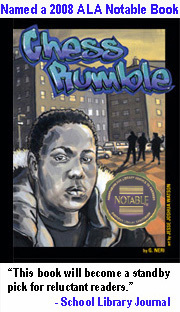 We were also very lucky to get the approval of the American Library Association who named Chess Rumble a Notable Book for 2008. Isn’t that enough? If someone affiliated with a gang shoots and kills someone else, then later ends up a victim of violence himself is that person a killer or victim? Greg Neri tackles this weighty topic in his next book, Yummy, the last days of a Southside Shorty through the eyes of Roger, a young man trying to process the life and death of Yummy, a neighborhood boy. Based on a true incident, this graphic novel illustrated by Randy DuBurke will be released by Lee & Low later this year. Can’t wait to check out Greg’s graphic novel, which will be a first for this publisher. Congratz on his success. What a great interview. G’s passion and intelligence really shines through. Thanks for posting it. Great interview with Greg. I’m looking forward to his upcoming YA novels as well! Wonderful interview! I just spoke to an educator looking for books that feature boys. I’ll definitely recommend Chess Rumble and tell him to be on the lookout for Yummy. Great interview. I just added Chess Rumble to our next book order for the library. I think our students will love it!